A unique new pathway between two gateway cities was created recently when President Barry M. Maloney and Springfield Technical Community College President John B. Cook signed a partnership agreement that offers STCC students a smooth transition to a bachelor’s degree in urban studies from Worcester State University. 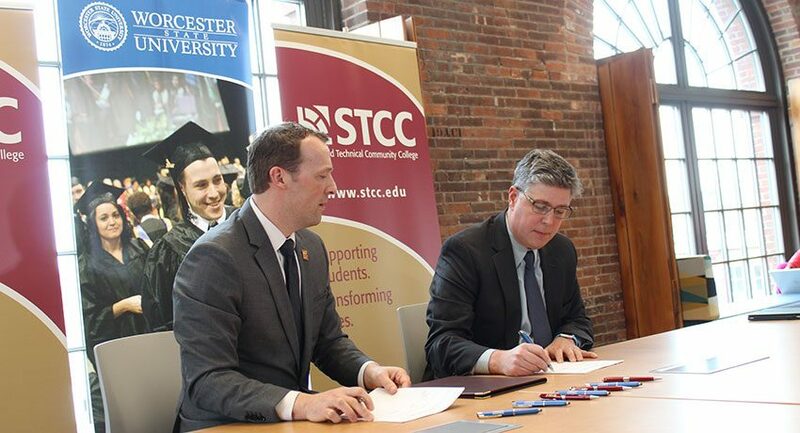 The “2+2” agreement comprises a new associate’s degree in urban studies at STCC, beginning this fall, that will allow graduates to transfer seamlessly to the urban studies program at Worcester State. Students will then have the further option to pursue a master’s degree in the Urban Studies Department, which usually takes a year in a 4+1 track. The urban studies program at Worcester State has long offered a master’s degree in nonprofit management, but recently two more have been added – a master’s in public management and a master’s in public policy. The subject of cities as a focus for college students could not be any more important or relevant than it is today, Cook said. While there are no simple answers, endemic poverty and the opportunity gap it creates, especially within communities of color, are among the many complex problems urban studies students will be trained to tackle, he said. STCC students will be able to get a sense of what Worcester State is like even before they enroll as juniors, according to Thomas Conroy, Ph.D., chair of the Urban Studies Department at WSU. 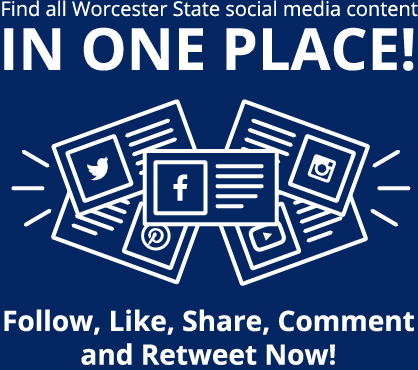 In anticipation of the agreement, the Urban Studies Department at Worcester State has already started to change parts of the curriculum to align more closely with STCC’s offerings. For example, “They have a class that they created called ‘The Immigrant City,’ and we’re starting to pilot one on our side that will be one of these moments of exchange between us,” Conroy said. It won’t be the same course, but it will have some shared objectives, he added. Urban studies helps students develop an in-depth understanding of the complex challenges facing our increasingly urban world. Urban studies majors traditionally pursue careers such as municipal planning, public policy, community organization, and nonprofit management. More broadly, urban studies is the highly interdisciplinary study of cities and the people in them, but the training prepares students for a wide variety of careers. The new partnership will opens an important educational pathway for many students, said Russ Pottle, dean of the School of Humanities and Social Sciences at Worcester State. “The ability to transfer seamlessly from an associate’s degree program to a bachelor’s degree program—and then with the potential to complete a master’s degree in only one year—is a real opportunity for students in Central and Western Massachusetts to pursue career interests in their immediate geographic area,” he said. Maloney and Cook thanked the faculty and staff of both institutions for pulling the new agreement together on a tight timeframe. “We’re enthusiastic cheerleaders for this project but, as usual as far as the heavy lifting goes, presidents are in the back of the bus on that,” Maloney said. On the Worcester State side, Maloney commended several people including Conroy, Pottle, Provost and Vice President of Academic Affairs Lois Wims, and Vice President for Enrollment Management Ryan Forsythe. 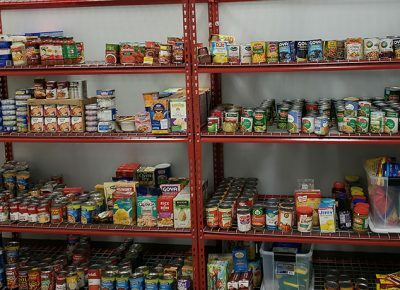 An official ribbon-cutting ceremony at Worcester State’s new food pantry will honor the memory of the late Thea Aschkenase ’07, who passed away on Saturday, March 23, at the age of 95. This essential resource for food insecure members of the Worcester State community is named Thea’s Pantry to recognize her lifelong dedication to feeding the hungry. The ceremony will take place on . . .